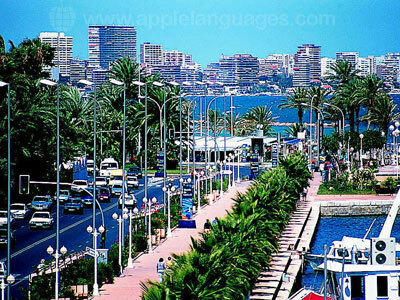 Learn Spanish in Alicante (Marina) | Spanish course in Alicante. Are you considering a Spanish course in Alicante? Would you like to learn Spanish by the beach? 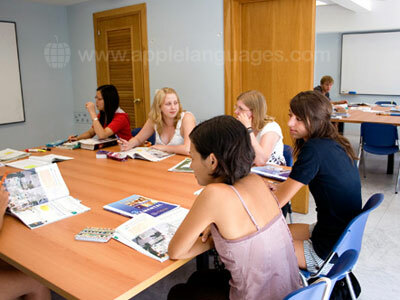 Then take a Spanish course at our Alicante (Marina) school! 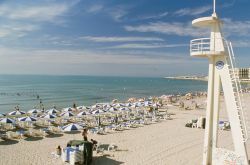 Alicante has some of the most beautiful, clean beaches in the Mediterranean, many of which are award winning. Students on a Spanish course at our school are just 2 minutes’ walk from the beach - a perfect place to relax in the afternoons after class! Alicante, between the mountains and the sea, is an ideal place to study Spanish – from mild temperatures and bright skies in the winter, to long, warm days in the summer, Alicante is a great location at any time of year! Our Alicante (Marina) school is centrally located, right on Alicante’s beautiful main esplanade, the Paseo de la Explanada, with great views of the marina and the beach. The elegant, palm-lined esplanade is a favourite with locals at night – a place to see and be seen! Don’t forget to try some of Alicante’s first-class food during your Spanish course – there are many reasonably priced restaurants along the sea-front offering a wide variety of local cuisine, from delicious tapas to freshly caught seafood! Our Spanish school in Alicante (Marina) offers 8 air-conditioned classrooms and free WiFi Internet access is available throughout the school. Our maximum group size is just 10 students, so you’ll receive plenty of individual help and attention from our fully qualified and experienced teachers. You can choose from a wide range of Spanish courses in Alicante, from our popular Intensive Spanish Course providing 20 lessons/week to our Super Intensive Spanish Courses, which include 25 or 30 group lessons lessons/week. Private lessons are also available and can be taken alone, or combined with a group course. With courses lasting from 1 week to a full academic year, you’ll find something to meet your needs at our Alicante (Marina) school! If you have any questions regarding our Spanish courses in Alicante, please do not hesitate to contact us. Course materials can be bought directly at the school and cost 35 Euros. To really immerse yourself in the Spanish language and culture, why not stay in one of our carefully selected host families? You can choose from a single or twin room with half board (2 meals/day) or full board (3 meals/day). Our students tell us that this is one of the best ways to make the most of your stay in Spain and practise the Spanish you’ve learnt in class. Or, stay in one of our shared apartments, which offer basic accommodation, shared with other students from the school. On a Spanish course in Alicante, you’ll be able to join in our school’s optional cultural activities program, making it easy to explore Alicante and the beautiful coastal villages beyond. Examples of typical activities arranged include museum visits and tapas tours. At the weekends, join one of the school’s many optional excursions to locations such as Valencia, Madrid, Benidorm, Xativa, Javea and the hilltop town of Altea. Please note that activities are not included in the course price and some may incur a small charge payable directly to the school. Public transport connections from Alicante Airport are excellent and you can reach the city centre by bus in just 30 minutes. If you would like to be met on arrival at Alicante Airport or Valencia Airport, please request one of our school’s airport transfers. This service is also available from Alicante and Valencia’s bus and train stations. Please contact us for more information. Average score for our school in Alicante (Marina) based on 33 previous client reviews. The course was very good and met my expectations as a beginner in learning Spanish. The tutors were very good and helpful. Other staff were also very helpful. The class size was small and I found this helpful. The accommodation in the school was satisfactory. I attended the Alicante School 19th to 23rd and had one to one lessons with Christina. This was my third visit to the School, unfortunately I can only do a week at a time. I have always enjoyed it but this time was my favourite. Christina made our couple of hours each day together the fastest two hours I can remember. We had fun but at the same time I really felt I made such progress, so much that had puzzled me just fell into place. I’ll be back to do all over again as soon as I can! What else could you want? A school full of talented, lovely tutors and in a lovely city like Alicante! Love coming here. Very short as bank holiday on the Monday but good. We had two teachers - one was excellent and I felt we progressed a lot with him, the other was not as good. Great to meet people. Not initially clear the difference between normal and intensive so I nearly missed out on the extra hour of conversation classes - would be good to have been told about that. ould definitely try to do it for longer next time. It would be good to have an idea of class hours before arriving. I left the course more enthusiastic than ever to one day conquer Spanish! Can't give a better recommendation that that! I really enjoyed the course. The teachers were very good and we had a good laugh ! There were only 4 in our group so concentration levels needed to be high. I feel a lot more confident now and look forward to another course in the near future. I would definitely recommend this course and this school. Go on the guided tours: the guide is a real pleasure to be with. All the museums had free entry . The course was very enjoyable, I was put in an A1 class so knew the majority of what was being taught, so it was more a revision week for me. If I was staying longer I would have asked to be moved to A2. The accommodation was basic, but fine for what I needed. My host family was very nice and I felt very at home. Also only spoke in Spanish so was a good opportunity to practise my Spanish. The course was good and the staff were friendly and always willing to help. I did feel myself improving on a daily basis. My accommodation was really well located as I was walking distance from pretty much everything. My host family was also very friendly and happy to help me with my Spanish. Everything was very efficiently organised. I found it very easy to book through Apple languages as I was able to discuss my requirements on the phone and they were able to advise me on the specifics of the school & advance arrangements needed. Everything was very clear, with prompt e-mail communication, confirmation & contact details for host family. I like the fact that they (Apple languages) are able to offer a wide selection of locations & advise accordingly on the merits of each place/ school. Would definitely use again. The course was good for being immersed in the language. I was only there for one week and one day there was no school due to a bank holiday but I was aware of this when I booked it. It would be more beneficial to be there longer. I would consider going on another course in the future. Emily found the total immersion technique extremely good and thought that she could have learnt the language really well if she had stayed longer. She said that the teachers were very good particularly the person that gave her one-to-one tuition. I found the course challenging, but very rewarding, the standard and style of teaching was exellent. The tutors, Pedro and Venesa not only made it interesting but also kept an element of fun to it. Overall it was an experience not to be missed. I stayed with a lovely landlady, who is also a great cook, the food alone was something to remember. Each and every one of the students in Mabels care were treated like a member of the family. The course was great, I was put in an appropriate level and improved at a rapid pace. I really enjoyed my time at the school, the teachers were friendly. My accommodation was cosy and really well located in the city center. I found course fairly challenging but was very satisfied with course content. The location of the school is excellent, teachers really helpful and very attentive to students needs. I was with a lovely group of students. Overall a very positive experience! Terrific teachers and staff. Had a very enjoyable time and was very pleased to be put into the correct level. Well done to all. The host family we stayed with was terrific. The food was great, she was very honest and fully emersed us in the language at home. The course was really good as there was only four people in total, which meant we had a better chance of learning the Spanish language. The accommodation was great in terms of the breakfast I received and the hospitality. However, I had no WI-FI during my time there, to talk to people at night back at home. The course all in all was really good, it was a great way to learn the Spanish course as no one spoke a word of English. I found the course challenging, but very rewarding, the standard and style of teaching was exellent. The tutors not only made it interesting but also kept an element of fun to it. A lovely landlady, who is also a great cook, the food alone was something to remember. Overall it was an experience not to be missed. I really enjoyed the course, the staff were really friendly and very helpful and I am hoping to go back again to the same school next year. The lady I stayed with was very friendly and welcoming which was very important for me as I was on my own and was hoping for a friendly face!! She put me at my ease and encouraged me as I tried to speak Spanish with her. I was placed in a level I felt was really appropriate for me and enjoyed all the classes. Shared student accomodation is basic but I thought the apartment was fine and with classes, the beach and meeting up with new friends, I was hardly ever really in it. Once again, Apple Languages staff were incredibly helpful and professional prior to the course and always returned calls promptly. The course was lively and the four hours went quickly every day! I liked the mix of sudents and the fact that we were all encouraged to participate. The tutors were very good, patient and interesting. This is the second course I have done - the school is friendly and there seems to be a well organised social element. I hope to do another course next year! Teachers were lovely and really understanding, seemed to enjoy what they were teaching and I feel like I learnt loads in a short time. Thanks again to the teachers! The course was really good, the level test was absolutely right and I was in a class that just followed on what I had been doing in the UK - but this time I understood it! The classes were good fun, the teachers were good and the 5 hrs a day flew by. I would like to go again! The courses were very challenging, yet doable… The instructors were very knowledgeable and helpful. I was very fortunate to have been placed with host family with two lovely daughters and an adorable little dog named Kiko. We became very good friends and they are now my Spanish family forever.